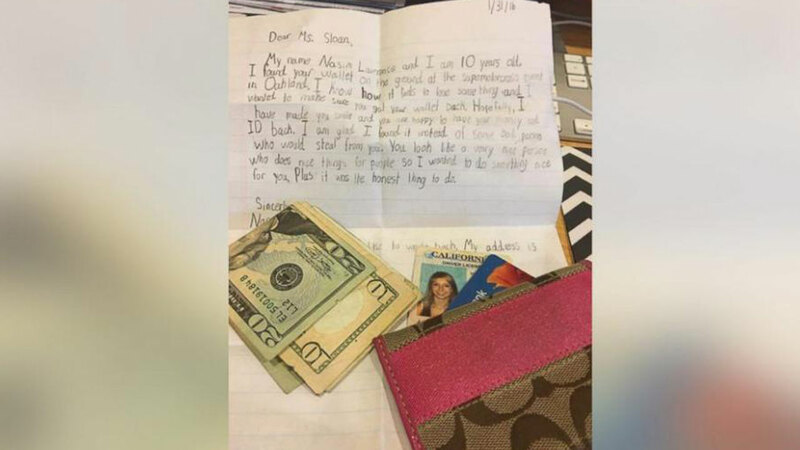 A California woman was moved last month after a child returned her lost wallet, along with an adorable note explaining why he did it. "It was just this simple act of kindness that just warms my heart," Taylor Sloan of Santa Rosa, California told ABC News. "I'm glad it's getting attention. It obviously goes to show that he comes from a really great family." Sloan, 22, said it was on Jan. 30 when she lost her wallet at a motocross event in Oakland. She said she was carrying her ID, debit card and about 30 to 40 dollars in cash. "I had my wallet in the back of my pocket and probably just lost it when I sat down in my seat," Sloan said. "I didn't see it was lost until the event was over." Sloan canceled her debit card and made her way to a local DMV for a new license. Then, she said, her mother called saying she had gotten a letter in the mail from a boy named Nasim, 10, along with Sloan's missing wallet. My name is Nasim Lawrence and I am 10 years old. I found your wallet on the ground at the Super Motocross event in Oakland. I know how it feels to lose something and I wanted to make sure you got your wallet back. Hopefully, I have made you smile and you are happy to have your money and ID back. I am glad I found it instead of some bad person who would steal from you. You look like a very nice person who does nice things for people so I wanted to do something nice for you. Plus it's the honest thing to do. "I was ecstatic," Sloan said of receiving the letter. "It was the sweetest thing. It was adorable." Sloan said she has written a letter back to Nasim and plans to send it, along with a $20 reward and a bag of candy. She added that she's been in touch with Nasim's mother, after she shared the letter on Facebook.